Some call Colorado the “Napa Valley of Beer” because of the sheer number of excellent craft breweries in the state. Having grown up in Indiana and still visiting often, I might suggest that Indiana has a shot to be that state in the Midwest. At the south end of Indiana, you’ve got the still-going-strong New Albanian Brewing Company, and at the north end you’ve got the outstanding Three Floyds Brewing. There are dozens of breweries of varying sizes in between, and more are popping up. In fact, the Brewers Guild of Indiana website shows more than 50 breweries in the state. Granted, the Hoosier state is still well behind Colorado, which boasts around 140, but it’s impressive nevertheless. As much as I would like to hit them all, my recent road trip was only for a weekend, so I decided to focus on Indianapolis. Heck, even in Indy I wasn’t able to hit them all. But I did get to 8 in a 24-hour period (and yes, I was a little worse for wear on Monday). Triton Brewing: Our first stop took us in circles a couple of times, but we finally tracked down Triton and its impressive brewery and taproom. Named for the son of Poseidon, Greek god of the sea, Triton was hopping the day I was there – my girlfriend Cynthia and I noted quite a few growlers went out the door during our visit. Always a good sign. We sampled most of them and talked beer with operations director David Waldman. The Fieldhouse Wheat was fantastic, and made with Amarillo hops for a nice little kick. Sin Bin Belgian Pale Ale is not your ordinary Belgian ale, crisp and light with a malty flavor and surprisingly little sweetness (a good thing, at least for my palate). Magnificent Amber Ale also scored high points with its hoppy nose and smooth, malty, caramel-esque finish. Both of us, however, may have liked the Deadeye Stout the best. It has such a big, roasted coffee nose that you’ll truly be thinking for a moment that someone threw a pint glass full of coffee into the fridge for an hour and then tried to punk you with it. But take a sip and you’ll find that it’s creamy and delicious beer, all right. In my tasting notes, I wrote, “Thank you, Triton, for this gift to our senses.” I wasn’t even tipsy at that point. We also tasted Bee Java Brown, which Waldman said includes a pound of coffee per 15 gallons – and it shows. I ended my taste tour with Alt Lang Syne old ale, a dry-hopped version of German alt that comes in at 7.2 percent ABV but drinks like half that, and Three Tine Tripel, an 11.2 percent ABV beer that is sweet, dry and deadly. The taproom has an industrial theme with wood accent, with natural brick walls in the taproom and lots of aluminum surrounding the bar. The space, Waldman said, was a mule barn in the 1920s and later housed race cars. He also noted that the name Triton isn’t entirely an accident – due to the hard water in the area, all the water at Triton is charcoal filtered and softened. Waldman also noted that Triton’s five-year plan includes a second brewery operation and distribution in Kentucky and Tennessee. There were several young women scurrying about handing out tastes and selling pints, while newcomers browsed through an awkwardly bound collection of laminated cards describing the brews at the bar. I had a DFG IPA that was very crisp, with a lingering hoppy flavor. At 130 IBU and 9 percent alcohol, one is all you should probably have, but it’s worth it. Nice. Brett’s Stout is a lightly sour stout that has a nice complexity to it, with a smooth body but a tartness and dryness that surprise. Belgian Dark Strong is another high ABV one at 9 percent, and is an extremely fruity (grape) tasting dubbel-esque beer. The Belgian Pale was also nice and floral, while the Special K Kolsch, winner of three Indiana Brewers Cups from 2011-13, is grassy and crisp with a hint of banana. A true “lawn mower” beer. The place was bustling and we had more stops, so we didn’t stay for a pint. I’d like to return when Bier is less busy. Thr3e Wise Men: This place felt a bit like a sports bar, set up like a faux ski lodge with light wood and antler racks along one wall, flat-screens everywhere and piped-in music, and a large, square bar. Our server was friendly enough, but I was bummed to learn that a sampler included only three beers. 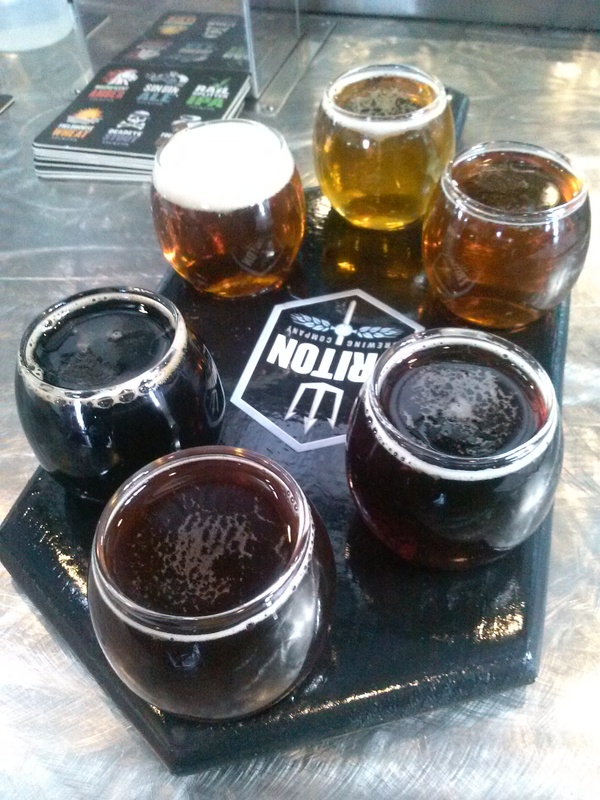 I chose H&C Porter, Golden Zoe IPA and the Centennial Martyr Double IPA. H&C Porter is made with local Hubbard & Cravens coffee and chocolate malt. It had a great flavor and fairly creamy body, but it was served a bit too cold for my taste – it muted the flavor a bit. Regardless, I enjoyed every sip I had. Golden Zoe was lightly floral on the nose, crisp and drinkable, but I had a hard time believing it was the listed 82 IBU. Whatever the case, I could have sat there and drank the stuff all day. Also, it went particularly well with the pretzels and Zoe mustard. Martyr Centennial Double IPA was like Zoe on steroids, at 8 percent IBU and 92 IBU. Now, this IBU rating I believe. The beer is made with local honey from Hunter’s Honey Farm in Martinsville, Ind., with Glacier and Falconer hops to make it dense and hoppy with a malt balance. I ended up buying a pint of Rocky Ripple, a milder ale made with Cascade, Crystal and Glacier hops. It had better hop flavor than either Zoe or Martyr, for my taste buds, and ended up being my favorite on the day. But one thing curious about our visit was that there were stacked bowls of popcorn behind the bar the servers were handing off to customers as soon as they sat down. We were the only party that didn’t get popcorn. Is there a secret password? Hmm. 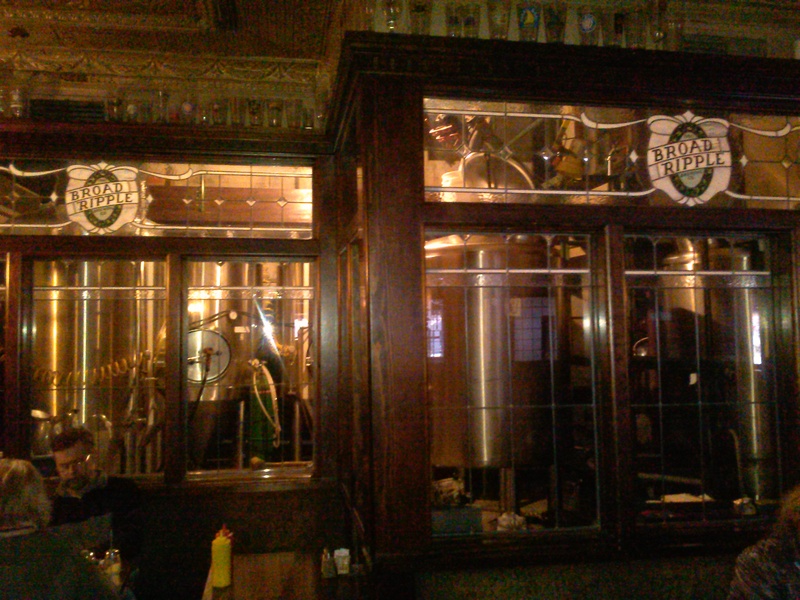 Broad Ripple Brewpub: I wasn’t expecting this one – Broad Ripple, which is located in the north Indy neighborhood of the same name, feels more like an English pub than a modern craft brewery. In fact, I wouldn’t be surprised if much of the interior was shipped here from England, stripped from some long-defunct pub from the late 1800s. Dark, cozy and tight, the bar area feels like being in Liverpool. sampler was available. I decided to get a Red Bird Mild Ale and soak in the surroundings. Red Bird is, as you would expect, an English style mild ale with lots of malt character. In fact, it reminded me a bit of Cains Finest Bitter, the pride of Liverpool, which sort of brought everything full circle for my pub experience. We weren’t in a hurry, so in the interest of completion, I decided to grab one more pint – in this case, the Yorkshire Pale Ale (told you this place was British). It had a light orange body, very mild nose and nice rye bite. At just 22 IBU, it was very mild, but had enough bite to be quite pleasing. I really want to go back to Broad Ripple. Soon. Rock Bottom Brewing: We didn’t originally intend to go to Rock Bottom, which is a Denver-based chain, but by the time we got back to our hotel room we were tired and starving and, well, Rock Bottom was just down the street. Hey, it’s a beer tour, so what the heck? Fortunately, Rock Bottom always has a few extras on tap besides the more mainstream-friendly permanent brews, which are a bit light on the palate. In this case I got a nice surprise with four additional beers that made for an enjoyable sampler. Winter Tartan is a Scottish ale that is malty, creamy, dark and smooth. Think stout light and you’re getting close, and at 6.2 percent ABV, it packs a fair punch. Skip’s Stout is much bigger and has a hop sting to it at 48 IBU. Really smooth and enjoyable beer. Very Pale Ale is a middle of the road session-type nitro ale that presents a creamy, medium body. I liked this, even though it didn’t strike me as anything really special. I finished up with Moonlight Porter. It was like drinking dark chocolate from a glass. I’ve actually had better porters, but this one is solid. Better yet? I had one mean flank steak for dinner. I got the cheapest steak on the menu just to save four or five bucks, but I wouldn’t trade it. I think Cynthia had steak envy, even though her fish and chips weren’t bad. 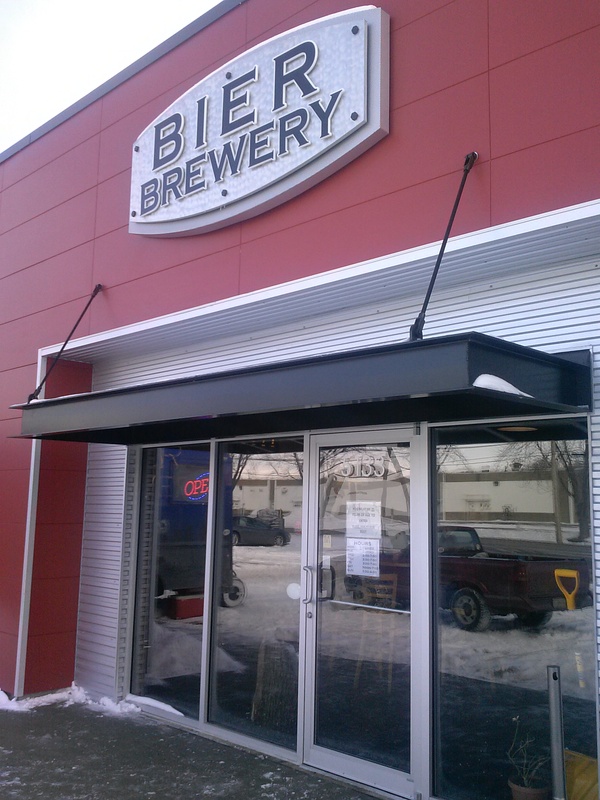 Coming Soon: Part II – Black Acre Brewing, Flat 12 Bierwerks and Oaken Barrel Brewery and Restaurant.